Child Development and Education 5 Edition Child Development and Education bridges the gap between theory and practice, showing those who teach and care for infants, children, and adolescents how to apply developmental research and theory to everyday practice. 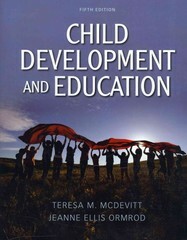 More so than any other text, Child Development and Education not only describes developmental phenomena--for infants through late adolescence--but also faciliates observations of and analyses of what children say, do, and create, ensuring that educators can make informed decisions that meet children's and adolescent's needs. New to the fifth edition is a sensitvity to the cultural and bioecological nature of development. New features of the text situate children and adolescents in the contexts of their upbringing and articulate the implications of these experiences for educators and other professionals. Illustrated is the diverse nature of development and how it is influenced by social, environmental, and cultural contexts. Also new to this edition is support for teacher licensure preparation. Teacher candidates are alerted to developmental concepts and theorists they need to know, and are provided practice test questions and case studies to review, demonstrating for them how to prepare for their licensure exam.